Welcome to Shellscapes, a beautiful collection of shells and shell arrangements! 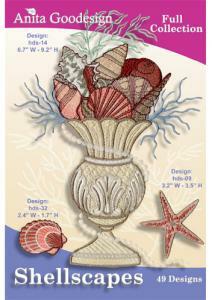 I have been designing shell embroidery designs for years. When I worked in the home decor industry shell designs was one of the most popular themes. When I created this collection I wanted to design something truly different with large arrangements, large applique shells and small stitched shells. The large applique shells are digitized using stippling and hand shading to give them a unique look, I am sure you will love embroidering them. We created two different towel sets for the projects and there is an additional tutorial titled "home decor techniques" that will give you additional tips on embellishing towels.